Paleoanthropologists do not like ribs (or vertebrae): they are seldom found in the fossil record, if found, they are broken and if complete, they are difficult to study because they look alike. Moreover, most paleoanthropologist regard ribs as the perfect scraps that can be destroyed in order to obtain a C14 direct dating. Thus, when I say that I study vertebrae and ribs, my colleagues do not always understand why. However, the vertebral column and thorax are key anatomical regions: spine morphology is related to posture and locomotion and the thorax protects lungs and the heart and it is provides muscular attachment for neck and upper limb muscles. Additionally, employing new technologies are providing new means to study these sometimes elusive anatomical elements. After years studying isolated vertebrae and ribs, taking linear measurements with callipers it became evident that we needed a more integrated picture. In fact, the thorax morphology of Neandertals had been a matter of debate since in 1856 when the first Neandertal ribs were found: they were so thick and robust! I met Ella Been in 2007 in Tel Aviv when I went there to study the Neandertal fossil remains housed at the Sackler School of Medicine. I was especially interested in one individual, Kebara 2 (nicknamed “Moshe”), which provides a rare opportunity to study the Neandertal thorax because this specimen preserves all the vertebrae and ribs. Ella Been had studied the lumbar region of this and other Neandertals and together with Patricia Kramer were proposing new ideas regarding their posture. Together with Alon Barash, Ella started to build a 3D model of the Kebara 2 spine in which the anatomical peculiarities of Neandertals were taken into account. It became evident that we needed to add the ribs to this model in order to fully understand the differences that we were finding in the Neandertal ribs and to see how they correlated to spinal morphology. 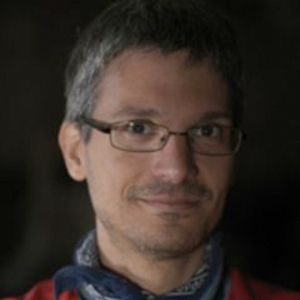 In order to do so, we also studied the orientation of the transverse process, one part of the vertebra that articulates with the rib, in Neandertals compared to a large modern human sample, a task that was done by Mikel Arlegi. 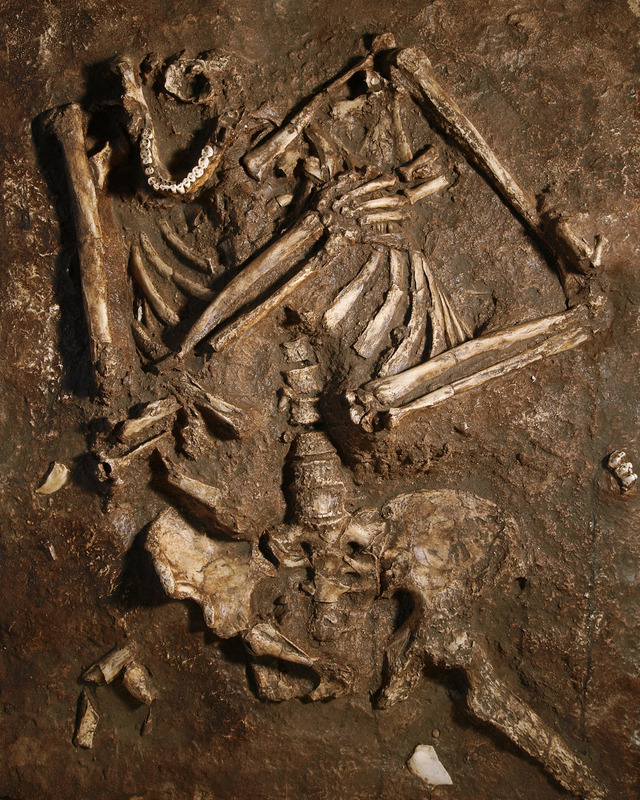 Photograph of the cast of the Kebara 2 skeleton as it was found which shows the preserved anatomical elements1 (Photograph courtesy of J. Trueba/Madrid Scientific Films). The path to the reconstruction of a Neandertal thorax was not easy: despite being the most complete Neandertal thorax, the ribs of Kebara 2 showed distortion that needed to be corrected and some of the ribs were not complete, so virtual mirror images of the most complete ribs were used. We worked days and days adding the ribs one by one, in proper anatomical position, to the spine model. In parallel, Markus Bastir and Daniel García-Martínez were applying Geometric Morphometrics to the study of the hominoid thorax, obtaining very interesting results. Thus collaborating with them was a logic step in order to have both a traditional and geometric morphometric approach in the study. Yet, despite all our previous studies, we got a surprise! We were expecting a volumetrically large thorax, but it wasn’t. However, there were striking morphological differences: this individual’s thorax was mediolaterally (side to side) larger than modern humans, paralleling the Neandertal wide pelvis, and with the spine more embedded into the thorax and the ribs more horizontally oriented. These morphological differences were suggesting a somewhat different breathing mechanism in Neandertals, one that relied more on the diaphragm. In fact, the larger lower thorax would allow larger volumetric expansions due to a larger surface area of the diaphragm. We also breathed a sigh of relief when we understood that our robust relatives did not suffer an oxygen shortage. I would like to thank to the co-authors of this study. Without their collective effort this would not have been possible. Very interesting! I was always under the impression that larger lung volumes were a Neandertal feature, so we stand corrected! Obviously I'll have to read the research paper to find out why the diaphragm was more important (just because of the wider width?) or were there other factors (such as smaller intercostal muscle attachment points, relative to bone size?) that lead to this conclusion? Fantastic work!